Let’s take a quick tour through the app and then I’ll demonstrate it in action with a quick video. On startup, the application prompts you to login. Please do not blame Ionic for my poor color choices. 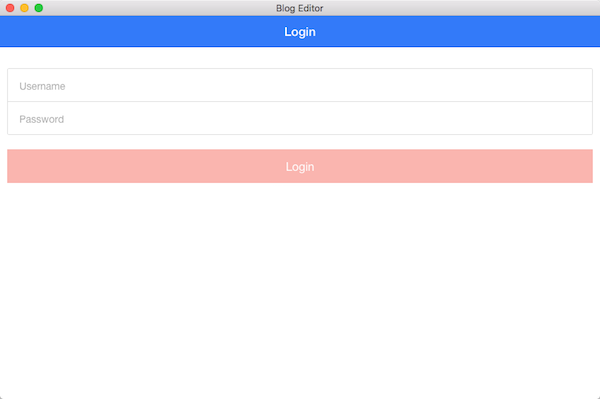 After login, you’re presented with a list of existing blog entries as well as a button to add a new one. For this quick demonstration, I did not add editing or deleting capabilities, but it wouldn’t be too difficult. And that’s it. 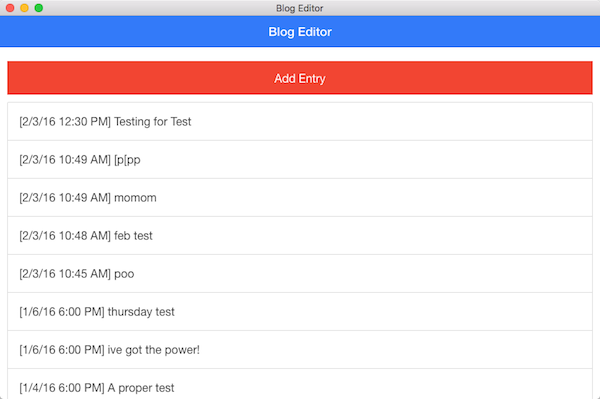 As I said, proper edit/delete isn’t built in yet, but that’s all it would take to turn this into a real CRUD desktop app for the server. Drag and drop images. I could capture the drop event - upload the file to the server, and automatically inject the HTML for the image into the source. This is how WordPress does it and it would certainly be possible with Electron. Of course, I could customize the icon like a “proper” desktop application. And probably more that I’m not thinking about. So how about the code? First and foremost I want to point out that StrongLoop has an AngularJS library and I that I should have made use of it. I did not. I want to - eventually - but I thought it might be a good opportunity to work more with AngularJS’s $resource feature. To be honest, I had a few problems with it and I should have taken that as a clue to just switch to StrongLoop’s stuff, but I was stubborn. As you can see - I simply $resource-wrapped my two main APIs - one for users and one for entries. (I’m still not really supporting categories yet.) For users I had to add the custom login method that ships out of the box. On the calling side, here is the controller code for doing login. First off - I’m hard coding the username and password in there just to save me on typing. That’s a pro-tip there. The login call is pretty simple, but I need to remember the auth token returned by the Loopback API. I both store it in rootScope (that’s bad, right? I’m ok with bad) and add it to my $http headers. I did that because I had trouble getting custom headers to work with $resource. That’s most likely my fault, but this worked for now. You can read more about authenticating requests and StrongLoop at the docs: Making authenticated requests. Finally - here’s how I save a new entry. Note I automate the slug and published values. You can find the source code for my app here: https://github.com/cfjedimaster/StrongLoopDemos/tree/master/blog2/client/electron-quick-start. I also built a quick video showing the app in action. Enjoy!